Manage your loads from Quote to Paid. Organize Loads into Trips for each truck. Build schedules and plan out routes better from one place. Your business is complex and it's important to keep accurate records and access them real time from any device securely saving you time. With CarShipIO’s notifications all parties are in the loop... each step of the way. Save time answering customer inquiries and getting latest status from drivers. Invoice clients in under 30 seconds. Switch to eBOL and do more with less. See which routes are paying you more, find out how much does each truck or driver costs you, and identify which customers pay on time and which do not. Enter your Loads and track them all the way from New to Complete. Organize your Loads into a Trip for each of your Trucks. Build schedules and plan out routes in a new, more efficient way. Dispatch loads to Driver App. Stay on top of you late pickups and drop offs. See GPS Location of your trucks. See which invoices are due in a second. Get your State miles breakdown for IFTA report. Switch to our efficient car carrier digital tools and streamline your business operations in no time. Driver EBOL and EPOD app to manage your car hauler loads on the go. Eliminate false damage claims with picture inspection. Capture client's electronic signature with your mobile device. Scan VIN barcode to update vehicle information. Capture expenses on the go. Invoice as soon as you deliver. Replace Bill of Lading with eBOL so you can complete vehicle inspections, mark damages, take pictures and have your customers sign right on your mobile device. Eliminate false claims with EPOD (Electronic Proof of Delivery) Record. M-22 AAIG Damage Codes OEM required inspection is supported. Save time and handle dispatches from your customers faster by importing them into CarShipIO. 30+ Imports from all major auto transport brokers and load boards. 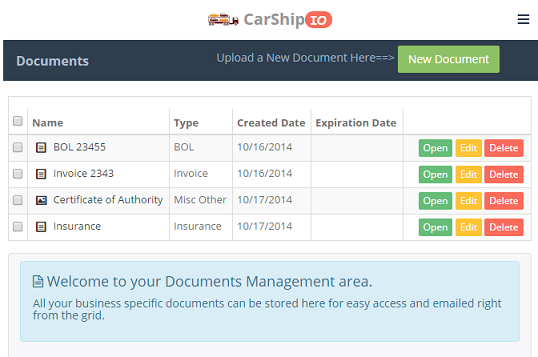 Automate all of your dispatches from your customers with CarShipIO Import. See the list of Auto Transport Load imports that we support. With CarShipIO, you can invoice clients with just a few clicks, and it takes just 5 seconds. Free your time by generating invoices with CarShipIO, and instead you can work on finding quality loads or spend time working on your marketing, that time can translate to thousands of dollars each month just by invoicing faster. Record and view all your car hauler expenses with just a few click. From fuel, tolls and lodging to maintenance & repairs. See the true cost of your trips based on actual expenses and obtain better estimates for future trips and jobs. Compare actual profits vs estimates based on true trip costs. Easily export all your expenses for tax and accounting purposes. Be ready and prepared for when taxes are due or for any audit. 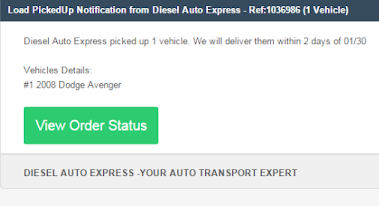 Want to get your shipper notified when the vehicle is delivered? What about notifying the receiver that the vehicle was picked up? How about letting the customer know that invoice is due? No problem! With CarShipIO’s automatic notifications all parties are in the loop … each step of the way. Inaccurate estimates can be costly. With CarShipIO Car Carrier Platform, producing accurate estimates in seconds has never been easier.… or faster. Quickly see your true numbers before accepting a job dispatch. 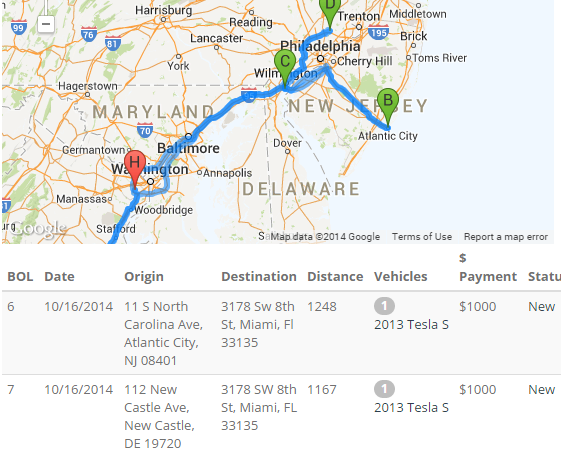 Get job costs and profits for the whole trip, for every vehicle and for each vehicle mile. We use your actual job history to make your cost estimates more precise. Stop wasting valuable time with paper, "hard-to-see" handwriting and blurry faxes. With CarShipIO all your important business records are at your fingertips. Store information and documents about your company, trucks, drivers, customers and jobs. Use your data to instantly generate Invoices, BOLs, eBOLs, Condition Reports and other forms. Gain secure and fast access to any document, from receipts to trip logs. Quickly email your customers important documentation, such as proof of insurance, FMCA Authority Packet, BOls, quotes, or invoices… right from the application. Switch to efficient digital tools and streamline your business operations in no time. See which routes are paying you more, find out how much does each truck or driver costs you, identify which customers pay on time and which do not, get your State IFTA Reports and your trucks true fuel economy stats.